Lots of conferences purport to address the issue of the relevance of Kierkegaard to contemporary life, but few deliver on that promise. This one did. There were over 400 attendees for the three day event and the topics ranged from “American Religion,” and “Kierkegaard as a Profit to the Church Today,” to “Some Contributions of Kierkegaard to Medical and Psychiatric Practice.” As with so many conferences, there was an embarrassment of riches in the form of many concurrent sessions each with a theme so interesting that it was very difficult to choose from among them. There’s no way I could summarize all the papers I heard, let alone all the papers presented at the conference, so I’m going to give only a few highlights and direct interested readers to the website for the conference for more complete information. The highlights for me on the first day were the presentations by Jan and Steve Evans. Jan Evans is a professor of Spanish at Baylor who specializes in the work of Miguel de Unamuno. Unfortunately, I know very little about Unamuno. Fortunately, Evans’ paper gave me a little insight into the respects in which Unamuno was influenced by Kierkegaard. I’m not going to take up space here discussing that issue, however, because Evans has a new book out on that very topic, entitled Miguel de Unamuno’s Quest for Faith: A Kierkegaardian Understanding of Unamuno’s Struggle to Believe (Wipf & Stock, 2013) so if you are interested you should check it out. You can even get it in a Kindle edition! C. Stephen Evans is one of the most important Kierkegaard scholars working today and an absolutely mesmerizing speaker. I knew his talk, “Kierkegaard on Natural Theology: Why We Can know There Is a God Without Proofs,” would be good, but I was concerned that I might have difficulty following it since it was in the evening. I find it really challenging to listen to more than a couple of presentations in one day. I like to think that it’s because I become so mentally preoccupied with issues raised in those papers that it becomes hard for me to concentrate on new material, but it could well be that I just can’t process that much information in so short a time. I needn’t have worried, though, that I would have difficulty following Evans’ paper. It was absolutely absorbing in terms of substance and was delivered in such an animated and apparently spontaneous manner that it was as if Steve were holding forth in one’s living room after a particularly pleasant meal. The time flew by. I was sorely tempted to attend the session on Kierkegaard’s contribution to medical and psychiatric practice because I am very interested in the philosophy of psychology and psychotherapy. Unfortunately, that session ran at the same time as Anthony Rudd’s presentation “Kierkegaard’s Christian Platonism.” Anthony is a dear friend and Plato one of my favorite philosophers, so I couldn’t really pass on that session. I had read an early version of a paper Rudd had done on Kierkegaard and Plato and found it fascinating. I think Plato had a much greater influence on Kierkegaard’s thought than is generally appreciated. Rudd is beginning what I hope will be an avalanche of work on this topic and not only did I want to support my friend, I wanted to get in on the ground floor of this new direction in Kierkegaard scholarship. 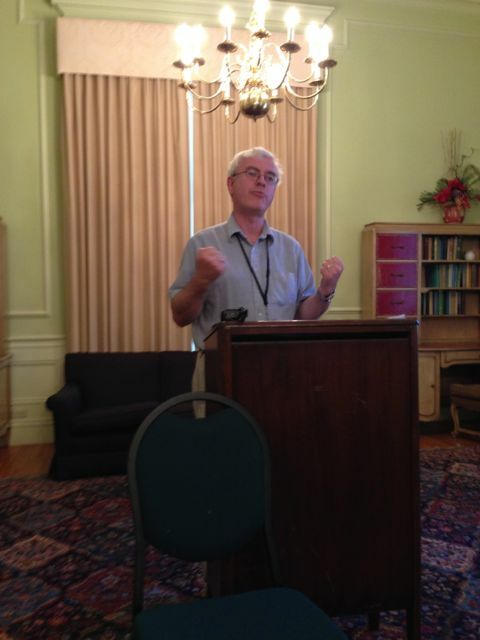 Rudd’s presentation was outstanding and generated a very lively discussion afterward because a couple of people in the audience thought Rudd had given short shrift to the distinction Kierkegaard occasionally makes between Plato and Socrates. Since Rudd was a “featured speaker,” his presentation will very likely be part of the volume that will come out of this conference so readers will be able to judge for themselves whether they think this was a weakness in Rudd’s argument. I don’t think it was. I think Rudd’s position was not just convincing but really exciting in that it is certain to generate much more work on this hitherto neglected but clearly very important topic. I will say more about the conference in a later post. Not the God of the Old Testament. More like the God of the philosophers. Not simply the creator of the universe though, but also the creator of the moral law, so the authority behind the moral law. I met you at the conference. My paper was one of those at the “Kierkegaard’s Challenges to Epistemology” session. It was nice to meet you and I am very thankful for your book! I was sad we did not get more of a chance to talk due to the large debate over the other presenter’s paper. I met you at the conference. I was one of the presenters at the session, “Kierkegaardian Challenges to Epistemology.” It was a privilege to meet you. I’m sad we did not get a chance to talk more due the the debate that occurred with the other presenter in the session. I am very thankful for your book. It is a tremendous resource. Yes, it would have been nice to talk. If you are willing to sending me a copy of your paper, I’ll be happy to include some references to it in my next blog post (acknowledging, of course, that the paper is not yet published and hence cannot be cited). I don’t have a copy of the other presenter’s paper, but I do have some very detailed email correspondence with him that I can use to refresh my memory concerning his argument. Thanks for your kind words about my book! Sure! I’d be happy to send you my paper. It’s very much a work in progress and I’m relatively new to Kierkegaard, but I’d be honored to have you look at it and reference it if applicable. What is an email I can send it to? What nice things you say! Send the paper to me at mgpiety@drexel.edu. I look forward to reading it!